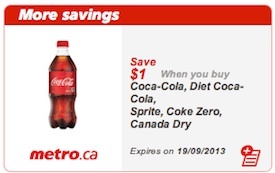 Printable coupon for Coca-cola is found on Metro’s new coupon page. Select the coupon, print it off and bring it into any Metro supermarkets across Canada. Metro supermarkets will accept your printed coupon. 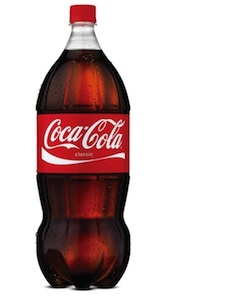 You will save $1 when you buy Coca-Cola, Diet Coca-cola, Sprite, Coke Zero, and Canada Dry. Coca-cola coupon is valid only in Metro grocery stores across Canada. It expires Sept 19, 2013. You will find coke, diet coke, sprite, coke zero and Canaday dry in the drinks aisle in Metro.